Angel Bay Crafting Hearts: STAMPAGANZA is back!!! 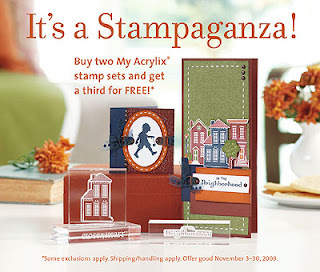 CTMH is offering the wonderful Stampaganza special for November 3-30. If you buy 2 stamp sets, you get one of equal or lesser value FREE! This is an amazing deal, as in the past it has been by 3 get 1 free. Be sure to visit my website and see what you're missing. Also, the stamp sets that are going to retire at the end of the year are all listed in their own category, as well as where they would normally be listed. So, click here for the Stampaganza Flyer and check it out!